YOUNG, Charles William (Bill), a Representative from Florida; born in Harmarville, Allegheny County, Pa., December 16, 1930; Army National Guard, 1948-1957; member of the Florida state senate, 1960-1970, and minority leader, 1966-1970; member, Florida Constitution Revision Commission, 1965-1967; delegate to Republican National Convention, 1968, 1972, 1976, and 1984; elected as a Republican to the Ninety-second and to the twenty-one succeeding Congresses; served until his death on October 18, 2013 (January 3, 1971-October 18, 2013); chair, Committee on Appropriations (One Hundred Sixth through One Hundred Eighth Congresses); died on October 18, 2013, in Bethesda, Md. Papers: 1960-2013, 162.14 linear feet. The C.W. 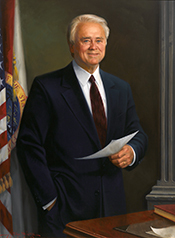 "Bill" Young Papers consists of government reports, files, legislation, news articles, photographs, and audio visual clips of Congressman Bill Young's time in office 1960- 2013. A finding aid is available in the repository and online.